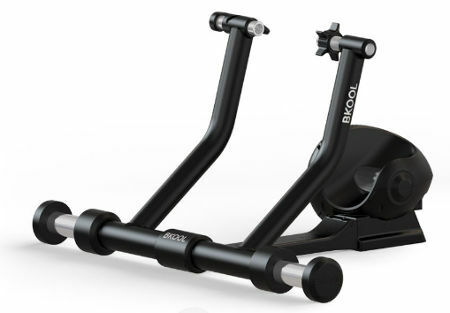 Bkool are at the forefront of turbo trainer hardware and software. They are pushing to make both as amazing as possible, but it is the Simulator software that has undergone the most changes recently. 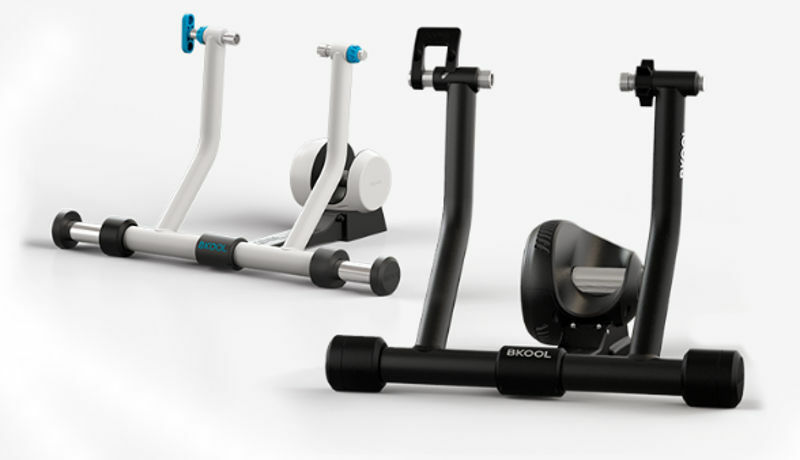 Currently Bkool have two turbo trainers, the Bkool Smart Pro and the Bkool Smart Go. Both of these turbo trainers are aimed at the more serious cyclist who is willing to spend a little more on a turbo trainer because they want all the added benefits that come with a high-end machine. In particular the computer controlled training and the interactive virtual reality software. Both the Pro and Go trainers use an electromagnetic resistance unit, meaning the resistance of the trainer can be automatically controlled via software. So, if you are riding up a steep incline on a cycle video or 3D environment within the Simulator software your trainer resistance will accurately and automatically vary. This takes indoor turbo training to another level. 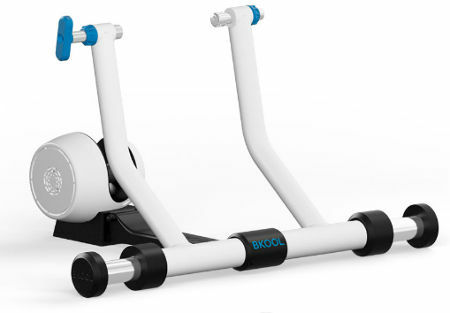 While both the Bkool turbo trainers are pretty similar they are aimed at two slightly different riders. The Smart Pro is the highest end trainer and its definitive characteristic is that it can simulate gradients equivalent to 20%. This is huge and most people would struggle to pedal at that level of incline. However, serious cyclists that want to train on serious hills and compete on routes that include savage mountain stages will want the Bkool Smart Pro. The Smart Pro can reach up to 1200W of power and emits noise of 75dB at 30KPH. That’s high power output and low noise. Bkool claim their trainers are the only to simulate inertia (read about inertia here), which effectively means you get a more [road] realistic experience because the trainer replicates real life as much as possible. The Smart Pro costs around £499. There is much more to the Bkool Smart Pro that is covered on the official Bkool website. The Smart Go costs around £319.99 from Bkool (check out the latest price here), which is about £130 less than the Smart Pro. So what are the differences? The Smart Go trainer can output a maximum of 800W of power, which is equivalent to an 8% gradient. This is quite a lot lower than the Smart Pro and is the main reason for the price difference. However, 8% is still a sizable incline and most cyclists will be working out below this level, particularly if training for longer times or at higher cadence. The Smart Go has the same low noise output of 75dB, it simulates inertia, and has all the other benefits of the Smart Pro, so the main choice is between price and maximum power. There are small specification differences such as the Go weighs 9.9KG vrs 11.6KG of the Pro, and the resistance roller of the Go is 3.5cm in diameter compared to a 5cm roller on the Pro. The way your bike wheel fixes to the trainer also differs, with the Go using a screw mechanism (similar to most other turbo trainers), whereas the Pro uses an adjustment lever. The official Bkool website has a clear side-by-side comparison of the Bkool Smart Go and the Smart Pro trainers. The new Simulator is what is getting everyone excited. The old Bkool Simulator was great but it had its problems. However, the newly released Simulator has really stepped it up a level. The main improvements are that there are now workouts that complement the cycling videos and 3D routes. This means you can either ride on a specific workout type or create custom workout that may, for example, include a short warm up followed by stepped increases in resistance. There is much more to the Bkool turbo trainer Simulator though, including the ability to ride on cycling videos, 3D worlds and more. The video below gives you a taste of what the awesome Bkool Simulator has to offer. The best thing to do is head over and check out the detailed Simulator page on Bkool’s website. There is so much more than covered here. Bkool is a dual hardware and software company offering two great trainers and a fantastic Simulator software. Ride almost unlimited routes from across the world in 2D maps, videos, and 3D worlds. You can even import your own routes. The Bkool Smart Pro is aimed at people who want to ride both flats and extreme hills, while the Bkool Smart Go is aimed at more conservative cyclists who want a good and tough ride but do not need gradients as high as 20%. Both trainers are fully integrated with the Simulator software and offer fantastic immersive cycle training.